This is the Matsuyama University official website. This website is managed and operated by the Public Relations Division, Management and Planning Department (referred to below as “the Public Relations Division”) of Matsuyama University. Matsuyama University takes no responsibility for the content of external links posted in the website. Matsuyama University owns the copyright. Unauthorized copying of the content of this site constitutes an infringement of copyright and intellectual property rights. 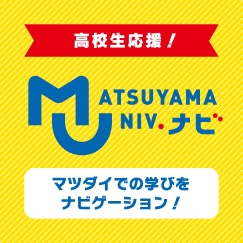 Links to the Matsuyama University official website may not be posted for profit-making purposes. We will not consent to links to the site being posted on sites which include content which may damage the reputation of the University or prove detrimental to it. Please notify the Public Relations Division if you wish to post a link to the site. Please note that the content and/or URL of each page may be altered or deleted without prior notice. The site has been tested on both Internet Explorer and Firefox. We are aware that there are inconsistencies between the Matsuyama University official website and the websites of individual faculties. We are planning a revamp to ensure greater consistency. Please note that there are certain differences between the Matsuyama University official website and the websites of individual faculties. This English website is only for reference purpose. When there are any discrepancies between original Japanese version and English translation version, the original Japanese version always prevails.